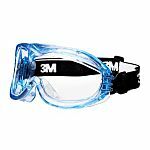 Direct Ventilation - allow the direct flow of air into the goggle, in cases where impact is the hazard and a splash or vapour hazard does not exist, a direct vented goggle can be used as an appropriate level of protection. Indirect Ventilation - provide protection from splash entry by a hooded or covered vent. The vented portion of the goggle is designed so that no direct straight-line passage from the exterior to the interior of the goggle exists. The purpose of the indirect venting is to limit or prevent the passage of liquid splash into the goggle. In cases where chemical splash is a hazard, indirect vented goggles should be selected as appropriate protection. Lenses come in different materials such as Glass, plastic, acetate, and Polycarbonate. Polycarbonate lenses provide the highest level of protection from impact. Some will also offer UV protection, anti - scratch and anti –mist, tinted or clear lenses. Prescription glasses are able to be worn under these goggles.